Let’s start with a happy Father’s Day from Salty Waffle. We thought in honor of the holiday, we would put together a little piece examining the father’s of social media. We’ll start all the way back in the 1800’s with Georg Simmel, the first scholar to think of social networks in terms we talk about them today. Georg Simmel was a German sociologist, philosopher, and critic. He had a huge influence on the study of sociology and wrote a number of influential books on various topics that shaped the study of people and groups. He defines society as a ‘higher unity’. He was the first to talk about social networks in modern terms and kicked off studies in urban sociology, symbolic interactionism and social network analysis with his book ‘The Metropolis and Mental Life’. Lawrence Roberts was the leader of a project called ARPANET in 1968. The project was funded by the Department of Defense and “was the world’s first operational packet switching network and the core network of a set that came to compose the global Internet.” He would later receive an award from Spain crediting him for, among other things, ‘the development of the internet’. Without the development of these network structures, we wouldn’t have the social networks we now use everyday. Eric Thomas, the creator of LISTSERV, the world’s first electronic mailing software. By using one email address, users could send email to an entire list of people very easily. This concept played heavily in the development of later social networks. Thomas runs a company with LISTSERV as one of it’s main products still today, a free version that supports 500 users can be downloaded from his company’s website. David Bohnett and John Rezner founded a company called Beverly Hills Internet in 1994. This would eventually develop into what we know as GeoCities. Users could build their own page on the site and the select the region it should be placed in, hence GeoCities. It was a marked advancement in online social networking and had over 38 million users when Yahoo bought it 2009 and subsequently shut it down. 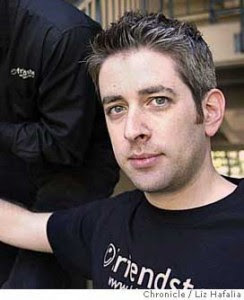 Andrew Weinrich founded sixdegress.com, an early social network that would give ways to more modern types of online networking like Friendster and MySpace. Users had profiles and could post to people up to the ‘third degree’ in their network. The idea is based on the ‘six degrees of separation concept’ and would allow a varying level of interaction with others based on your degrees of separation. He has since founded meetMoi, one of the first location-based social dating sites. Gibby Miller is a web designer who launched MakeOutClub.com, the ‘first widely used and popular‘ social networking site in 1999. It was founded as “a music/subculture related social networking site to provide a community for persons with similar style and musical tastes” and “features user profiles, image galleries, private galleries, message boards, blogs, private mail, and music and entertainment news.” Despite it’s name, it is not a dating site in any way. Jonathan Abrams and Peter Chin are the founders of Friendster, dubbed the ‘grandaddy’ of social networks. It was “founded to create a safer, more effective environment for meeting new people by browsing user profiles and connecting to friends, friends of friends and so on, allowing members to expand their network of friends more rapidly than in real life, face-to-face scenarios.” At it’s peak, Friendster was the dominant social network and signed up 3 million members in it’s early months. Before closing the social network side, Friendster had 115 million registered users. The success of Facebook has pushed the company to focus on gaming and entertainment aspects of the site and it is now positioned as a complement to Facebook, not a competitor. Tom Anderson was the founder and president of MySpace and the face that everyone who ever had a MySpace knows are their first friend. MySpace was launched just 10 days after Friendster went live and set to mimic the most popular features of the site. MySpace would go on to be the most popular social network before succumbing to questionable ad deals, bad user experience, and the rise of Facebook. The site now focuses heavily on the music industry and connecting individuals to music and artists. Mark Zuckerberg the founder made a household name by the movie “The Social Network’ that chronicled the birth of Facebook and the controversy that came to surround it’s young founders. Zuckerberg founded Facebook in 2004 while in college and the site now has over 600 million registered users. It is the biggest social network in the world. Facebook is beginning to become what some call the ‘fabric of the web’, creating a platform with which to take the social element of our online lives to non-social networking sites. Their goal is to make the sharing of information open and easy. Over 40% of Americans have a Facebook account. Well there you have it, the fathers of social media. I skipped a number of important people for sure, certainly we should put someone from AOL on there and I didn’t mention the founder of LinkedIn, but this list does represent some of the biggest leaps in social networking and the father’s of the ideas or projects that made them possible. Feel free to comment with people you think should be considered among the father’s of social media and have a fantastic Father’s Day! Thanks for providing us information about these guys. I was just looking for such kind of interesting post since morning but now i have found it. I have really liked to read it. weblog link on your page at suitable place and other person will also do similar in favor of you. you, I certainly get annoyed while other folks think about concerns that they just do not understand about. You controlled to hit the nail upon the top and also defined out the entire thing with no need side-effects , other people can take a signal.